Now that Maxis has finally revealed its Samsung Galaxy SIII pricing going off from RM999, have you decided which telco will you be buying the Galaxy SIII from? In case you’re still calculating to see which is the most worthy based on your area and usage, let us help you out a little with the price comparison. Both Maxis and DiGi are offering the phone from RM999 for a limited time period while Celcom is offering it from as low as RM1,398. Here’s a comparison for the cheapest phone price from all three telcos. Although Celcom may have the most expensive total cost of ownership at the end of contract duration, it comes with 2000 pool credits to be shared over voice calls, SMS and MMS – worth RM200, so if you actually use up the entire 2,000 credit, it’s actually pretty cheap. 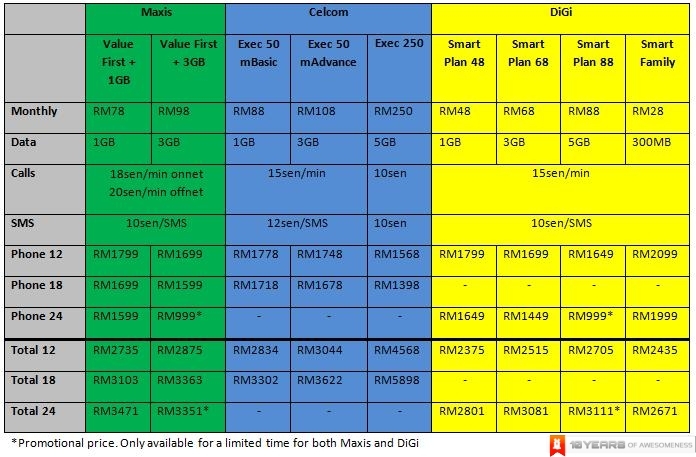 Maxis and DiGi’s plans calculated here are based on their promotion price. Hit the break for a more comprehensive comparison with all the plans available from all three telcos and let us know which one’s your pick.